Awesome right?!! I got this coupon for myself. I got to go pick a Spring dress - anything $40 and under. There were some super cute dresses to choose from! I ended up getting my free dress & buying one that I just had to have. 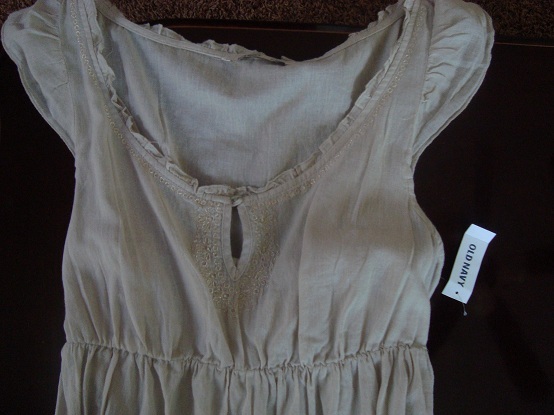 This seasons dresses are flowey , lots of cotton & linen - some what ethnic - Moroccan feel. Lots of tunic style cuts, which I really like. Natural, beachy - I loved them. Along with my free coupon, I got three coupon to give to friends!! You can imagine the fun day that turns into! 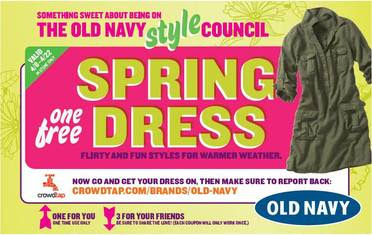 Shopping and dinner out with the girls - thank you Crowdtap & Old Navy! You too can work your way up to brand ambassador & sampling. Just sign up at Crowdtap - where consumers and brands collaborate!